By Oksana, On January 22, 2019 , In Desserts. This Eclair Recipe from Soviet cookbook for the pastry shops and bakeries is definitely the Best ever! The pastry, and frosting are made completely from scratch and the filling is absolutely delicious! • Preheat the oven to 425 degrees. • Line a sheet pan with parchment paper. • In a large saucepan, bring the water, butter, and salt to a rolling boil over medium-high heat. • When it boils, immediately take the pan off the heat. • Stirring with a wooden spoon, add all the flour at once and stir hard until all the flour is incorporated, 30 to 60 seconds. • Return to the heat and cook, stirring, 30 seconds. • Scrape the mixture into a mixer fitted with a paddle attachment (or use a hand mixer). • Mix at medium speed. • With the mixer running, add 5 eggs, 1 egg at a time. • Stop mixing after each addition to scrape down the sides of the bowl. • Mix until the dough is smooth and glossy and the eggs are completely incorporated. • The dough should be thick, but should fall slowly and steadily from the beaters when you lift them out of the bowl. • Using a pastry bag fitted with a large French star tip, pipe fat lengths of dough (about 2 cm in diameter and 12 cm in length) onto the lined baking sheet, leaving 2 inches of space between them. • Use your fingers to smooth out any bumps of points of dough that remain on the surface. • Bake 10 minutes, then reduce the heat to 350 degrees and bake until puffed up and light golden brown, about 25 minutes more. • Try not to open the oven door too often during the baking. • Let cool on the baking sheet. 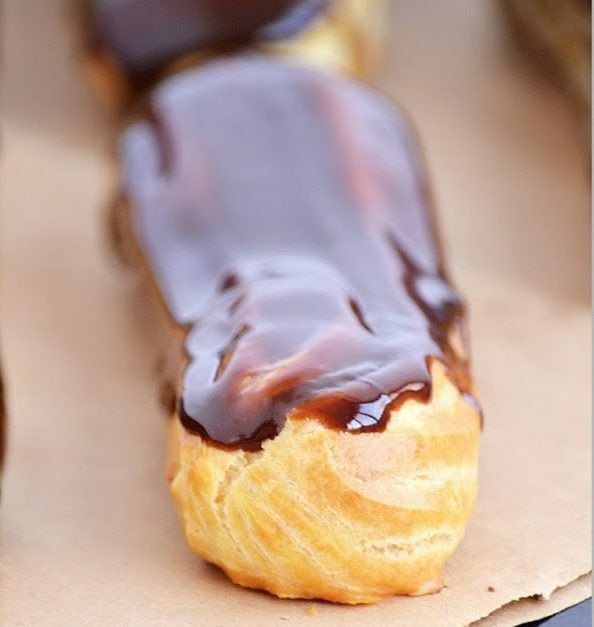 • Fit a medium-size plain pastry tip over your index finger and use it to make a hole in the end of each eclair (or just use your fingertip). • Using a pastry bag fitted with a piping tip, gently pipe the custard into the eclairs, using only just enough to fill the inside (don’t stuff them full). • Dip the tops of the eclairs in the warm chocolate glaze and set on a sheet pan. • Chill, uncovered, at least 1 hour to set the glaze. Today I have for you a homemade vanilla custard recipe, which can be used for a pastry cream for eclairs or Napoleon Torte or enjoyed on its own. Custard is a variety of culinary preparations, based on cooked mixture of milk and eggs.